Momentum has released its latest video on antisemitism, which shows a Jeremy Corbyn supporter who is Jewish explain her experiences of discrimination in the Labour Party and the broader history of antisemitism in Britain. 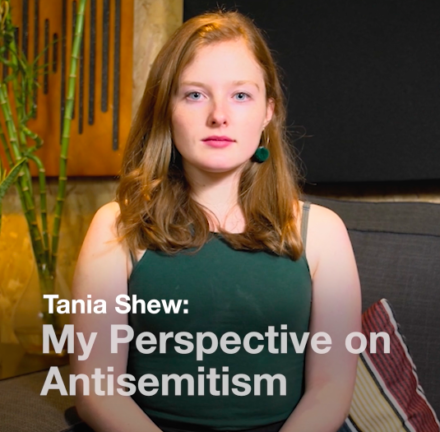 Tania Shew, a history student who worked on both Corbyn leadership campaigns, is the second Jewish Labour activist to star in a Momentum video focussed on antisemitism after the Corbynite group released one featuring commentator Michael Segalov in August. In the video, Shew explains her belief that the left has the tools at its disposal to fix antisemitism within the labour movement. She says: “I first started volunteering for Jeremy Corbyn the first summer he ran as leader of the Labour Party. And I support Jeremy because I think that Tory austerity is literally killing people, it’s imperative that we get a socialist government as soon as possible. “I still hear a lot of people saying that there isn’t a problem of antisemitism on the left, that they’ve never seen it. I’ll start by sharing some of my experiences of being Jewish on the left: I have encountered a number of anti semitic tropes in left wing groups and online spaces which I have been a part of. I have had left-wing friends share Rothschild banking conspiracies on Facebook and I have had comrades imply that Israel controls the British or American governments. One left wing mentor once said that all problems in the Middle East were the fault of ‘The Jews’. I have also encountered countless insinuations that a Jewish lobby controls the media. “It is common for people to start interrogating me about my views on Israel within seconds of me revealing my Jewish identity, whilst I hadn’t been asked a single question on the subject when this identity was hidden. Israel is a country half way across the world which I have literally never been to. I can’t vote in their elections, I boycott Israeli goods. The only thing that connects me to the Israeli government is that we happen to be members of the same ethnicity. This atmosphere of suspicion which many Jews on the left experience is a culture which needs to be addressed. “I think this stems from a problem within wider British society around how the history of antisemitism is understood. I think, partly because Britain defeated the Nazis in the war, there is a disproportionate focus on continental European antisemitism and a neglected understanding of the centuries of institutionalised antisemitism which took place right here in Britain right up until 40 years ago. I have encountered people on the left implying, or even outright stating, that British Jews are not a ‘proper minority’ because of this misconception. “In medieval England Jews were subjected to ghettoisation, violent massacres and were required to wear special signs on their clothes. Britain was the first country in medieval Europe to expel all Jews. The Aliens Act of 1905, Britain’s first anti immigration legislation, was passed specifically to reduce the numbers of Jewish immigrants and refugees seeking sanctuary in Britain. “In the 1930s, as fascism grew across Europe, Britain was no exception. Oswald Mosley’s British Union of Fascists, and their many supporters, would routinely march through the impoverished Jewish areas of the East End, accusing these working class Jews of controlling the banks and the media. Antisemitism in the UK persisted after the war, with many sports clubs, youth groups and schools continuing to operate ‘No Jews’ policies or Jewish quotas until the anti-racism legislation brought in by Labour in the 1960s and 1970s outlawed this practise. “When this history is highlighted, it hopefully becomes clear why so many Jews in Britain are still so sensitive to anti semitism. To me, it also seems evident that the left already has the tools at its disposal for discussing issues which are historically sensitive to Jews. The first left-wing theory which I think could be employed here is the understanding that the same words can carry different weight depending on who says them and on what social power they possess. “Addressing antisemitism in Britain should never curtail freedom of speech for Palestinians. Palestinians must be able to define their oppression in whatever terms they see fit. The left is one of the few spaces in British society in which Palestinian voices have any platform and I deplore anyone trying to take that away. “However white British people of Christian descent have another history and another set of power dynamics of which they need to be mindful when discussing Israel/Palestine, in light of the history of antisemitism which took place here in Britain. They have an antiracist obligation to demonstrate awareness of this historic oppression. They must ensure that the language they use to describe Israel does not veer into the language used over the centuries to segregate, persecute and even commit violence against British Jews. “This type of forensic understanding of intersecting power dynamics and histories comes as second nature to many people on the left. Jeremy Corbyn’s supporters, for example, have been some of the staunchest critics of Theresa May, but when Owen Smith said he wanted to ‘smash her back on her heels’, Corbynites were also the first people to condemn such language and demand sensitivity to gendered power dynamics. “People who aren’t members of marginalised groups are often unaware of many of the manifestations of the prejudices which they don’t experience. I can’t count the number of times, for example, I have experienced an interaction as sexist and a male witness hasn’t been able to see what the problem was. Tania (@tania_shew) worked on Jeremy Corbyn’s two leadership campaigns.